MSW incineration was our most popular report this week! What are the trends and developments that are driving MSW Waste-to-Energy plant development worldwide? This report, based on live and verified data, gives a unique perspective. Find out more. WtE incineration projects represented 36% of reported new or planned waste project capacity in June 2015. In June, Ghana announced a major investment in upgrading the waste services of Accra, the capital city. This will provide an estimated 1.1 million tonnes of capacity and generate 57 MW of electricity. AcuComm’s extensive monthly coverage provides information on the latest developments, trends, statistics and in-depth analysis to give you and your business a commercial advantage. In the week ended 23rd August, AcuComm added new or updated waste projects to our Waste Business Finder database, worth an estimated US$4,995 million and reported waste capacity of 1.2 million tonnes. This takes the total estimated investment value of projects to US$322 billion. Municipal Solid Waste (MSW) accounted for the largest share of projects by feedstock type in the past week. The USA and UK were the leading countries, with nine and seven projects respectively. They were followed by Canada, Australia and China. Finding new opportunities and being aware of the activities of competitors and collaborators or understanding the strengths and weaknesses of a market is essential work but can be a time consuming task. By using AcuComm’s powerful search capabilities in Waste Business Finder, you can drill into reports and statistics that will help you to identify relevant projects and new sales opportunities. Click here to find out more. 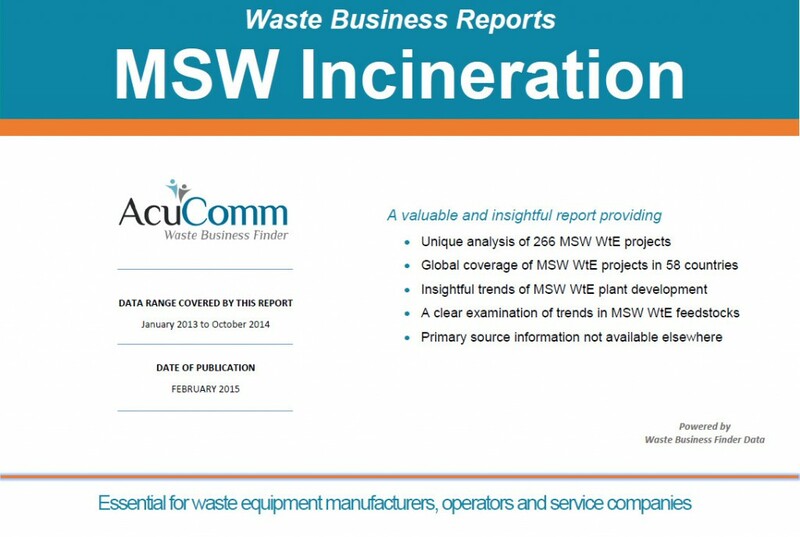 This week, our most popular report was MSW Incineration. For a clear, fact-based and practical assessment of the health of the MSW WtE sector based on real projects and not market estimates, nothing comes close to this report. Click here to find out more. In June 2015, Ghana announced a major investment in upgrading the waste services of Accra, the capital city. This will provide an estimated 1.1 million tonnes of capacity and generate 57 MW of electricity. AcuComm’s WBM can be purchased as single copies or as a premium annual subscription. The in-depth trends, company and country analyses and statistics that WBM provides are not available from any other source. In the week ended 17th August 2015, AcuComm added new or updated projects to our Waste Business Finder database, worth an estimated US$4,496 million and reported waste capacity of 3.2 million tonnes. This takes the total estimated investment value of projects to US$337 billion. WtE incineration was the largest category in both reported waste capacity and power generation this week. The leading country this week was the USA, with 13 projects included. It was followed by the UK, Japan and China. 3,492 verified global projects – with more added and updated daily! 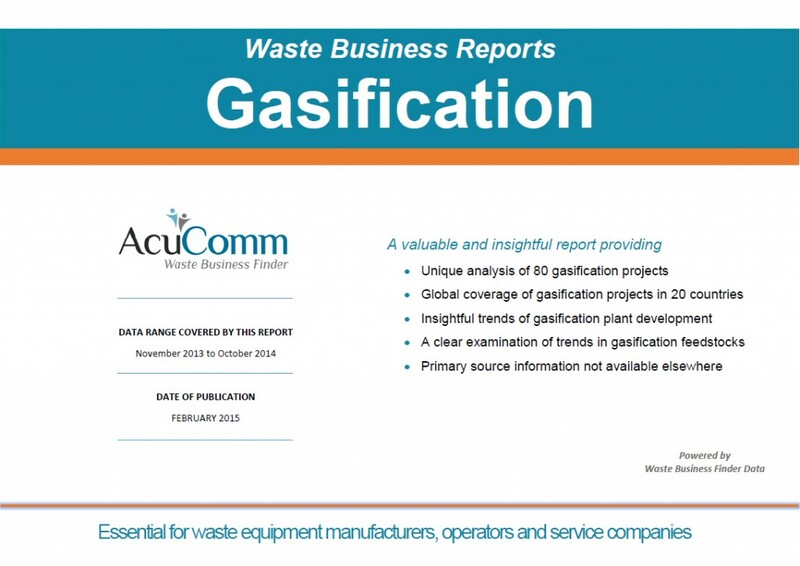 This week, our most popular report was the Gasification issue. Since the beginning of 2013, AcuComm has monitored over 80 gasification plant developments in 20 countries worldwide. This efficient technology is being adopted from Algeria to the US and brings 7.8 million tonnes per annum capacity to the global waste sector with 56% coming from Municipal Solid Waste. Wood-based materials – whether waste products or grown specially – are increasingly being used as a fuel for providing domestic power for heat and light. Significant waste investments occur not only in developed markets, but across the developing world. Once work starts, the average project takes around 18 months to become operational. Most however, have ongoing operational requirements for much longer. WBM is based on AcuComm’s Waste Business Finder database – the largest daily-updated source of waste plant trends and developments. There is simply no other way to get detailed market insight that is current and relevant! In the week ended 10th August 2015, AcuComm added new or updated waste projects to our Waste Business Finder database, worth an estimated US$4,353 million and reported waste capacity of 5.7 million tonnes. This takes the total estimated value of projects since 2013 to US$324 billion. Industrial waste accounted for the largest share of projects by feedstock type in the past week, with an annualised figure of just over 2.7 million tonnes. The average waste project is worth US$102 million. There are naturally wide variations in average project value due to size, duration and complexity of the projects. The Waste Business Finder database provides you with all the waste processing and recycling plant development projects from around the world. For information on how you can gain access to business critical data on this fast-growing industry, click here. This week’s most popular Waste Business Report was the special edition on China. 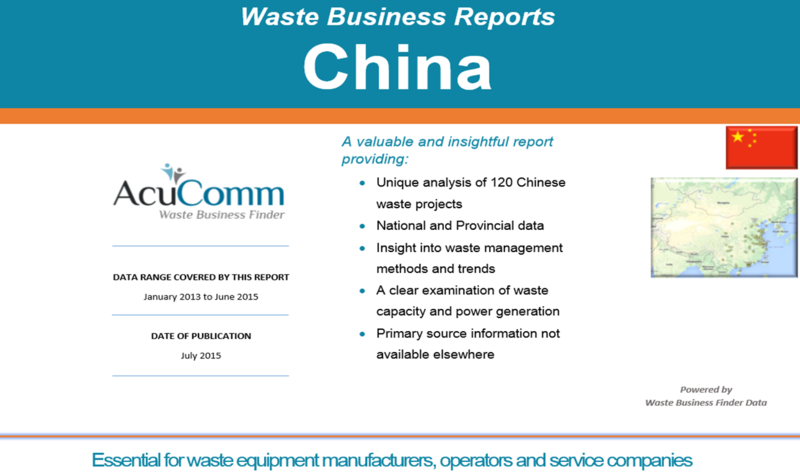 The China Waste Business Report presents data allocated by AcuComm for the WBF database. This information is updated daily and includes projects from around the world in all areas of the waste management industry. For a comprehensive picture of waste management developments and trends in the Chinese market, click here.